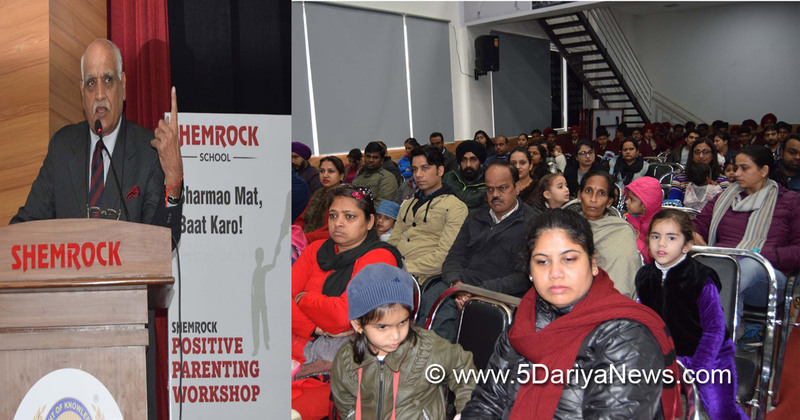 A workshop on Positive Parenting Sharmao Mat Baat Karo was held at Shemrock School, Sector- 69 for the parents. Retd Major General Raj Mehta was Key note Speaker at the moment and shared his views on how to look beyond the behavior of a child and to connect more with them. He stressed upon the need to identify the qualities in each child and help them nurture it accordingly. He elucidated not to impose your dreams and wishes on your child. He further urged the Parents to encouraged positive attitude of children and ensures constructive interactions While interacting with the parents He, later also discussed important aspects of good parenting in order to provide best for children. According to him it is necessary that old system of reviewing be replaced with the dynamic teaching reviews. He advised parents to take a few simple steps at home that help their children enjoy and excel. According to him as a parent sometimes we tend to overlook small achievements of our children, which actually need encouragement. Praising a child for an improved behavior too is an important part of parenting.Director Education of the school Air Comd. (Rtd) S.K. Sharma discussed various facets of Positive Parenting. He gave detailed information about how to facilitate the development of positive behavior including brain development, Social development and Learning Development children.